Taken out of the school system and homeschooled, the Yap boys show what can be achieved with the active involvement of their extraordinary parents. Thinking out of the box is the new normal in their home. Except that they can’t afford to think in clichés. Mathew Yap and his wife, Pew Ying, have chosen the road less travelled in education. They have taken all three sons out of school and homeschooled them for some time. “Disappointed? No RI!” exclaims Mr. Yap, a Rafflesian from 1971-76, who doesn’t sound unhappy at all that his sons have not attended his alma mater. “It was a rather enriching journey, somewhat of an adventure, makes me a better husband and father I think, ” he adds, musing on their homeschooling experiences. And it looks like he and his wife took the right course. Here’s the result. Today, eldest son Jeremy is 22 and has graduated with a diploma in new media studies from Republic Polytechnic. He is now doing national service. Their second son, Joseph, 20, has worked for six months as a pre-school teacher and will enter national service in November. He got his diploma in early childhood education from Ngee Ann Polytechnic last April. The youngest son Alyon, 16, also wants to go to a polytechnic after his O levels. Jeremy, by the way, has Asperger’s syndrome, a form of hidden autism. Alyon’s autistic behaviours are a bit more obvious. Jeremy was offered exemption from national service by Mindef, but he chose to serve nevertheless. “It’s an honour to do national service,” he says. Those were exactly the words his father used on the day they made the decision after a specially-convened medical board review at the Defence Ministry’s CMPB (central manpower base) earlier this year. Mr. Yap explains he told his son he could opt out of national service, but it would be an honour to serve the nation. Talking to the Yaps and their homeschooled sons, you see how often they are on the same page. When Joseph says he wants to do communications and media studies next and is asked why, the swift reply is: “I want to be like my Dad.” “The fruit doesn’t fall from the tree,” quips Mrs. Yap. Mr. Yap, 55, a former Straits Times journalist in the late 1980s who subsequently worked for Standard Chartered Bank and British Petroleum before setting up his own training consultancy, now also has publication covering Malaysia with focus on Iskandar, the ambitious development project in Johor. 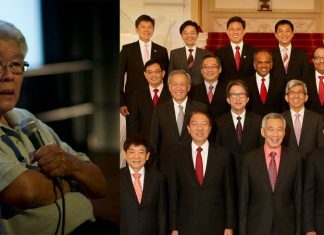 He can be seen in photos with Mr. Lee Kuan Yew, Mr. Goh Chok Tong, Mr. SR Nathan on one wall of the living room in his East Coast condominium. Mrs. Yap Pew Ying, 52, is a Raffles Girls School alumna who once taught in the gifted education programme in her alma mater but resigned as a teacher after she had her second son. She has not stopped teaching altogether. She continues to be a relief teacher. To begin with, she did not even know their eldest son had autism. “He had a gift for mimicking people,” she recalls. “He could mimic their speech without even knowing the meaning of the words.” He also loved to read. But he could hardly cope with the pressure as the time drew near to sit for the PSLE. Sometimes he would have to stay up till midnight finishing his maths and Chinese lessons. Naturally, he sought relief. “Sometimes he would hide in the toilet for an hour to read a book,” remembers Mrs. Yap. There were also problems in school. Sometimes he would be bullied by the other boys and, pushed to the extreme, he would burst out. Finally, at 15, Health Ministry’s psychiatrists confirmed he had Autism-Asperger syndrome. The school system more than a decade ago did not seem geared for students like Jeremy. Mrs. Yap had no illusions about how he would fare, given that he was particularly weak in Chinese. She could not blame the child. Her husband, a Straits-born Chinese Baba, and she herself, from Malaysia, did not even study Mandarin in their school years in the 1960s and 70s. But, for Jeremy, it was clear if his Chinese did not improve, that would drag down his grades and affect his future. And so, Mr. and Mrs. Yap had no choice, but to figure a way out. Being a teacher helped a bit in the thinking: Their son did not have to study Chinese to get into a polytechnic, she realized. All he needed were five O levels. But he had to study Chinese in secondary school. So she took him out of school and homeschooled him herself. There was one unforeseen consequence. “I also don’t want to go to school,” said the second son Joseph. He was perfectly fine, but did not understand why only his brother should be allowed to stay at home. He also wanted to be taught by his mother. “So I ended up teaching both of them, and had to bear in mind that they were two years apart,” she says. Jeremy and Joseph needed five O levels but, to be safe, she made them take seven subjects, including Bible studies and – her own specialty – English literature. And she did not only teach them herself. They also enrolled in MDIS College, which prepares students for the O levels. In hindsight, the Yaps seem to have made the right choices, but at the time they went through a lot of soul-searching, a lot of angst. Mr. Yap gestures in the air as he recalls sleepless nights, wrestling with heavy, academic and medical books on autism and Asperger’s syndrome. “It was not easy reading,” he says. But he wanted to understand the conditions of his sons so he could help them. “We were inspired by our friends,” says Mrs Yap, talking about a couple. Trained teachers, they are “NIE (National Institute of Education) gold medalists”, she adds. And yet they decided to homeschool their own children. Not every teacher can take care of children with special needs, says Mrs. Yap. She laughs as she recalls times when she was asked by Jeremy’s and Alyon’s teachers if they would be continuing in school. They meant well, agree Mr. and Mrs. Yap. The teachers had their sons’ best interests at heart. They needed special care. But even teachers trained to teach children with special needs can’t handle all of them equally well, says Mrs. Yap. Some are good with children suffering from sensory dysfunction like Alyon’s odd autistic behavioral tendencies and obsession about cleanliness, others are better at teaching other children with hyperactive behaviours. The Yaps have moved house in quest for a better education. They moved out of their landed house in Kembangan to an apartment in Siglap just because it was only a five-minute walk to Alyon’s Opera Estates Primary School. Now the family lives in another condo in Katong. “By homeschooling him, I’m giving him time to mature,” says Mrs. Yap about her youngest son Alyon who is being homeschooled now again after two years in MacPherson Secondary School. Their plan is to let him do a preparatory course for O levels next year or 2015, and later enrol him in a polytechnic. Alyon’s favourite subjects include geography and biology. “We are looking at a few private schools for his O levels preparation,” says Mr Yap. Alyon looks younger than his years and has a tendency to carry on talking about something he liked even when his parents tell him to stop. He is able to remember “long strings of numbers”, says his mother, adding he also loves trains and cricket. He will get to see both when he goes to England where, with his sharp memory, he will probably get to know the London Underground like the back of his hand. He has already got wind of a London Underground maven who will bring him up to speed. And, yes, he will watch cricket. His parents are taking him to England this month as a treat, having taken the elder sons to Turkey last year. When they were taken out of school, he tried to make sure they continued to mix with others. So he started a scout troop for children like them. He recalls former president SR Nathan once met them at a function and asked which school they represented. “He was taken aback when I said they were not in school,” he adds with a smile. No wonder the former president was taken aback. When did you last meet a scout troop of boys and girls who did not go to school? Yes, the Yaps are unusual. Mr. Yap, a former NorthEast CDC councilor, does not buy even the standard take on happiness. Happiness cannot be defined by material success, he says, it varies from person to person. Mrs. Yap, of course, agrees with him. The English teacher, who regrets the young generation is “ill-read”, made a habit of reading together with her family, sharing books and ideas with them. When a family reads together, all the members stay on the same page.